The Palestinian people and their region are continually in the news and at the forefront of international diplomacy. Yet much about their history remains obscure. 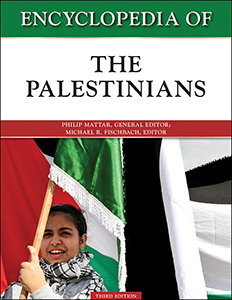 Encyclopedia of the Palestinians, Third Edition is the definitive source for high school students, undergraduates, and general readers who want an account of these people and their long history. This comprehensive resource includes new entries on recent developments and personalities and updates of many of the existing entries. It also includes a document section, including entire texts or excerpts of key documents on Palestinian history. A chronology, glossary, and annotated bibliography round out this edition. Philip Mattar, Ph.D., holds a Ph.D. in history from Columbia University. He was Senior Fellow at the United States Institute of Peace, a Fellow at the Woodrow Wilson Center, and a founder and president of the Palestinian American Research Center. A former director of the Institute for Palestine Studies, Washington, DC, Mattar was on the advisory committee of Human Rights Watch/Middle East. He is a member of the board of the Council of American Oversees Research Centers, and of the Middle East Policy Council, where he also manages their endowments. He has taught the history of Palestine and the Palestinians at Yale University and Georgetown University, and his articles on Palestine and the Arab-Israeli conflict have appeared in such publications as Foreign Policy and Middle East Journal. He is the author of The Mufti of Jerusalem: al-Hajj Amin al-Husayni and the Palestinian National Movement, editor-in-chief of Encyclopedia of the Modern Middle East and North Africa, and editor of Encyclopedia of the Palestinians, Third Edition. Michael R. Fischbach is professor of history at Randolph-Macon College. His Records of Dispossession: Palestinian Refugee Property and the Arab-Israeli Conflict received Honorable Mention at the first annual Benjamin L. Hooks Outstanding Book Award Contest. His Jewish Property Claims Against Arab Countries received second prize in the British Society for Middle Eastern Studies' annual British-Kuwait Friendship Society Book Prize for Middle Eastern Studies, and was a finalist for the Gerrard and Ella Berman Memorial Award at the Jewish Book Council's 2009 National Jewish Book Awards. He is also the author of State, Society, and Land in Jordan and The Peace Process and Palestinian Refugee Claims: Addressing Claims for Property Compensation and Restitution, and the editor-in-chief of The Biographical Encyclopedia of the Modern Middle East and North Africa. He is coeditor of Encyclopedia of the Palestinians, Third Edition.